"This workshop is a perfect guide to what I was looking for," said one of the small business owners that attended the event. With over 400 million active users, Facebook is one of the most powerful marketing tools in the world, internationally used by thousands of businesses wanting to brand their name and become better known. Although Hispanics are only a small percentage of the total population of Internet users, they are a fast-growing group, especially within the United States. 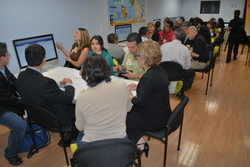 For this reason, the Su Socio de Negocios seminar, presented by parent company El Clasificado, was filled with many Hispanic entrepreneurs from the Los Angeles region, each yearning to learn the newest, most beneficial ways to manage their companies’ Facebook pages. Font discussed the basics about managing a Facebook page and the advantages of marketing in social networking sites. He advised business owners to spend at least two hours a day updating and managing their business profile and to avoid being too obvious when marketing your products, “keeping a low profile will generate more results in the long run,” said the Facebook expert. 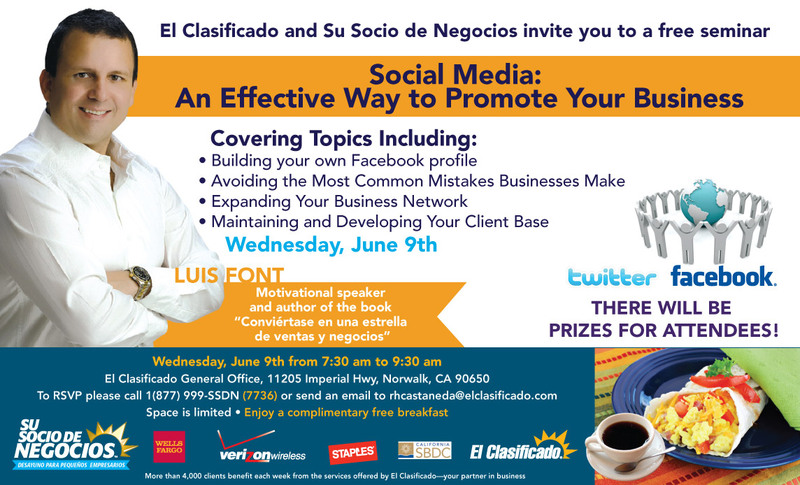 El Clasificado’s Su Socio de Negocios small business breakfast event took place on June 9, 2010 and also included informational booths by event sponsors such as Wells Fargo, Verizon, Staples, Social Security Administration, Small Business Development Center and Sam’s Club. The next event is scheduled for October 13, 2010 and will have renowned María Marín as the keynote speaker. “Su Socio de Negocios” (http://www.susociodenegocios.com ) is a series of events and expos in Spanish which El Clasificado began to offer in 2006. El Clasificado (http://www.elclasificado.com ) is a Hispanic multiplatform media company that provides a marketplace for Spanish speaking Latinos in grassroots communities. With over 18,000 online classified ads, 4 million monthly page views and over 200,000 unique visitors ElClasificado.com is the leading online classifieds portal connecting buyers and sellers in the U.S. Latino market. El Clasificado print is a verified publication with a weekly circulation of 400,000 and is distributed to more than 200 cities in Los Angeles, Orange, Riverside, San Bernardino, San Diego, Ventura and Kern Counties. See press release in Spanish in attached document.